The Defence Centre for Operational Oceanography (FCOO) is part of the Danish Defence Acquisition and Logistics Organization. 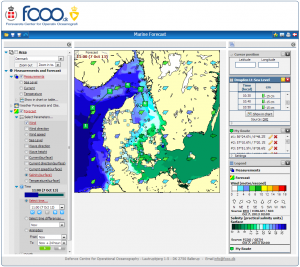 FCOO collects, validates, stores, and disseminates oceanographical, meteorological and hydrographical data and products. Data and products are developed not only for Danish waters but increasingly also for use and support in arctic areas – especially the waters surrounding Greenland. FCOO consists of 14 employees, including engineers, oceanographers and meteorologists as well as data and IT specialists. FCOO is member of Arctic ROOS, BOOS and NOOS.